Welcome to Twenty Seventeen: A New Beginning. New year. Fresh start. Clean slate. The perfect time to take a look back and see what worked…and what didn’t. I’m determined to keep the good but do away with the bad. I’m really not much of a goal-setter. My problem with setting goals is that, like most of the human race, I feel like a failure if I don’t reach them. So my answer to that problem is usually to just skip the goal-setting altogether. However, this year I did decide to set some goals. Just a few. After all, there’s no need to get carried away. I’ve divided these goals into personal and professional…so here goes. I have three personal goals for 2017. The first is to start walking again, outside, with Kelly. A few years ago we were attacked on a walk by a large dog and even though it’s been a long time, I’m still afraid. I am determined to overcome this fear and be able to again enjoy a walk with my dog. I’m not exactly sure how to go about it, but I’m going to figure it out. My second goal, and this sort of goes along with the walking, is to take better care of myself. I don’t do a very good job of putting myself first or making time for myself. I don’t eat right and I don’t sleep well. All of these things are connected and if I can improve on even a few, the rest may fall into place. That’s my hope anyway. My third personal goal is to somehow get rid of the carpet in our living and dining rooms. Seriously people…it just has to go. I am saving my money but I still don’t know if I can afford what I really want. After all this time, I don’t want to “settle.” Hopefully, things will work out so I’ll keep you updated. Some of you may wonder how exactly I make a living from this blog. I have never really spelled it out in a post, but I do on my Disclosure Statement page. If you are interested, you can read it HERE. It’s actually just like a blog post…I promise it’s not a bunch of legal jargon. On my Disclosure Statement page, I explain the many different ways I earn money. My main goal for 2017 is not to add more income streams, but to concentrate on the ones I already have. I’ve planted the seeds and now it’s time to nurture them, and take care of them, so they grow. First and most importantly, I want to continue to post relevant content for you to read. I want to expand my digital line in my Etsy shop and I want to add fresh designs to my Society6 shop. I’m going to share more of my eBay articles here on my blog as well. If some great opportunity presents itself, I will certainly take a look…but I have my hands full with my current endeavors and have no plans to add any more. One other professional goal I have is to make more and better videos. I showed you a few in my Best of 2016 post. If you missed it, just click HERE. All that said, I think it’s important to distinguish between dreams and goals. I still have dreams…but they aren’t goals that are within my reach. 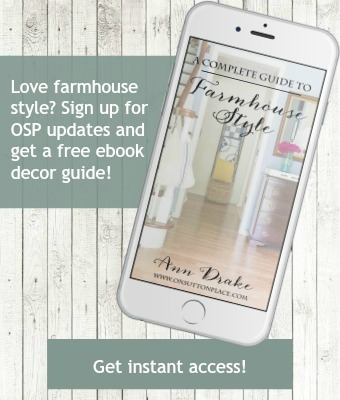 I would absolutely love to renovate a farmhouse and be featured in a magazine. Those are dreams I’ve had for a very long time, but they don’t define me and they are no longer goals. I don’t think about them very often and am truly happy right where I am. I’m a firm believer in the concept that dreams do come true…because I have seen it happen. That’s why it’s so important for us to NOT give up on our dreams…we just have to put them in perspective. 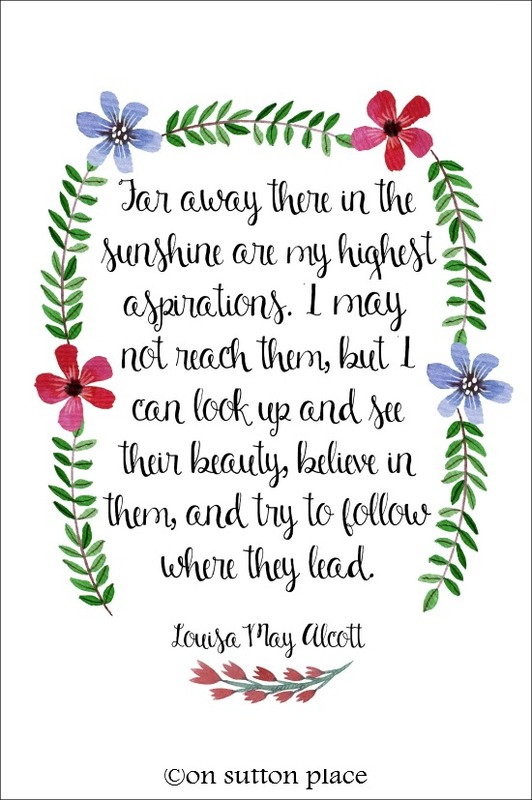 Click to download Louisa May Alcott printable. So…let’s take today to leave the past year in the dust and open the first page of a brand new book called Twenty Seventeen. It’s crisp and fresh…and the pages have never been turned before. This is your year to shine. If you are still deciding on a 2017 calendar, don’t forget about my free PDF. Would you like to read new posts from OSP without ads? Become a subscriber and be the first to receive ad-free posts via email. I too have done the shift with Dreams and Goals. It’s fun to let the mind wander and explore those dreams and at the same time know that even though they are no longer realistic goals – nor do I want them as goals any longer, it’s fun to visit them from time to time. I hope you can get back to walking this year. I walk 5 days a week with a neighbor and it is such a multi-faceted activity for me. The physical movement, the intellectual stimulation and the emotional download is real. Although your dog doesn’t talk back, I bet it’s a great listener. Thank you so much for your blog and I love how you share your printables with us for free. I have downloaded and framed so many of them – I look forward to seeing what’s new each season. Happy New Year Ann! Great post. I hope you will get out there and walk again. It will get better with time. I’ve had 2 bad experiences and one was with a dog I knew! What I do differently now is that I’m very aware of my surroundings looking around and in back frequently. I don’t listen to music anymore while walking. I have a smaller dog now and wouldn’t want anything bad to happen to her. All that to say, I know how you feel…. Your blog is classy, timeless, well-done. Can’t wait to see what you have in store for 2017. Blessings to you and your family in the New Year, Ann. Like to come to you web sight to see what’s new. Every thing is so pretty and you have suggestions for projects. Your statement … “New year. Fresh start. Clean slate” is my favorite I’ve read so far and I’m going to adopt it! Clean slate is true! Thanks for your blog, your regular posts, inspirations and the fun things you share. All the best in 2017! I thought about you and Kelly the other day as I was walking. I wondered how Kelly was doing. I know it will be hard to return to walking, I know that it sure makes me feel better when I can walk. Happy 2017 Ann! Wishing you good luck with your goals this year. Your #2 is my goal for this year, I’m glad to know I’m not in this one alone. The Louisa Mae Alcott quote touched my heart. I’m looking forward to a new year of your informative, fun and helpful posts and lovely inspiration from you! I wish you luck in overcoming your fears and living life to the fullest. Take your dog for a walk. Carry a big stick or a taser but don’t be afraid to walk. Take care of yourself or you won’t be able to take care of anyone else. Happy new year! I love checking in on your blog…. One thing I would love is videos on your sewing tips! Esp all the great pillows you showcase! Blessings for a new successful and love filled year! Cheers! Thank you for sharing your thoughts on your goals for 2017. I’m not one for making goals normally, but this year, my personal goals are much like yours. It’s nice to know that I’m not the only person who needs to focus more attention to eating right, walking again, and taking better care of myself. Being a caregiver, I’m giving so much of myself to caring for others that I don’t take any time for myself, so this year, I’m hoping to take the time to do something special for myself at least once a week. Plus, eat better, walk daily and take better care of myself, so that I can be the best person I can be. Keep us posted on your progress, it will help encourage me to keep up with my goals. I also wanted to thank you for the awesome calendar that you gifted us, I will enjoy using it in my home. Happy 2017 Ann ???? Taking care of ourselves is the hardest thing to do. We are daughters, wives, mothers, caregivers. We love with our whole hearts which is exhausting, but we wouldn’t have it any other way. With that being said our goal of placing us first almost always falls short. I finally allowed myself the pleasure of trying a way of eating to help me balance my life simply. All the foods I eat I like to eat. I look at all the things available instead of the items not recommended. I feel good, I look better, and most importantly by making this simple change my bigger goals are in progress with confidenence. Please look at Whole Food 30. I never ever push my beliefs on people. We all have our own individual needs, likes, and life styles. This has changed me, and your blog and honesty have changed my ideas for my home ect… We are all in this together! Happy New Year! Happy New Year and thank you for a lovely honest post. When I changed careers and had lots of time on my hands I started following your blog. It was the first one I ever did. I remember your post about Kelly. My heart went out to you then and it still does. Walking your dog is a small pleaseure. Our Aussie was a good walker. Unfortunately I lost my walking partner before Christmas. It’s rather lonely without him but I’ve challenged myself to get back out there. Your post reminded me of that. Hopefully the walking and eating right will help with your sleep patterns. And for me drinking plenty of water is a must. So here’s to a happy healthy 2017 for all of us! Dog attacks are terrifying. I was once attacked by a dog we adopted. My advice, go out and walk. You have taken hundreds of walks without being attacked. Our latest rescue dog is a sweetie. If I had let fear rule me, I would have missed out on the companionship of this dog who desparately needed a safe, loving home. I like your realistic and honest approach to life. Thank you for the lovely printable…it is one of my favorite quotes and I printed it out to put up in my kitchen. Another of her quotes I love is “Keep busy and hope” as a way of facing worry and fear when her husband was away in the war. We made your eggnog bread and it disappeared like magic at our family dinner last night. I love the way you make homemaking a valuable and respectful career. It is full of freedom to create and learn new things. I find it the most rewarding career option for me! It is satisfying and fulfilling, and there is no need to retire, just various phases of life in which to reinvent yourself in new ways. So one good motivator for me to exercise, eat better and get good sleep is what it does for my brain…especially in avoiding possible dementia as shown by research. Maybe that can motivate you too. Lots of good reading on the subject. A good book I’m reading is Boost Your Brain by Majid Fotuhi, M.D., Ph.d..
On goals…I believe they are important and also to define as you did between a dream and a goal. I began learning to play Celtic harp at 57 when I retired and now at 64, I’ve decided I’d like to perform for small groups. So I’m moving forward on accomplishing that goal. It’s scary…but I’ll never know if I don’t try. Sounds like you may have a bit of PTSD from that dog attack. Maybe a counselor can help you move past it. I’ve had that from a car accident and it took me awhile to feel ok driving…so I understand. Best to you in 2017! I enjoy your posts. Happy New Year. 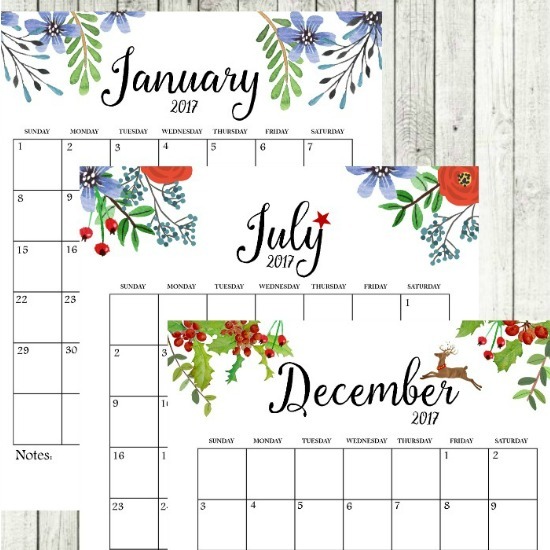 I love your calendar and other lovely printables you share. Thank you. Happy New Year Ann!!! I’m like you, I don’t make big goals for the year, I just try to improve on what I already have going on. I hope all the best for you and yours, a healthy , happy and prosperous new year. Have a Blessed Day every day!!!! Blessings to you and yours in this wonderful new Twenty-Seventeen year. As always, your blog inspires. Always you give to me something for the hand, something for the head, and something for the heart. Thank you. I found your site while searching for unique printables. Imagine my surprise when mom told me your home was in the next neighborhood over, and your home next to one I frequently babysat in, no less! I cannot imagine a dog attack so close to my home. It is shameful people do not treat all animals with the respect deserved, leading to an outcome that has altered another’s habits. I wish you resilience as you begin 2017 and enjoy your lovely neighborhood. I believe in goals. “A failure to plan is a plan to fail.” I think your goals are great! Way to realize that you need to “put the oxygen mask on you first.” Do you have mace? I run with it to ward off dogs and people! I’ve never had to use it but would if threatened! Here’s to a healthier you! I love it and I love your videos. I have so very much enjoyed your blog and all that you offer to us readers. You have inspired me to keep moving forward and I too am going to set a few goals for myself. I love your classic simplicity without being fussy. Thank you for the link you posted today about tips when walking your dog. I am so sorry that happened to you and your beloved pup, Kelly. My dog, Bubba, was also attacked by 2 huskies. The owner had ear buds in, too, and was not paying attention to his dogs. They were on leashes, but one of the huskies broke his leash as he charged at Bubba. No one was hurt, thankfully. I just want to reiterate a tip of yours – please don’t wear earbuds when walking your dog! Pay attention to what’s going on around you and your pups. Bad things can happen and no one wants that. Take care, Ann and I hope you and Kelly enjoy many more carefree walks together! Great comments, Ann. I am looking at changes in my life this year, and I feel it will be a great year. I love your posts and look forward to them. I agree with your goals of becoming healthier. Somehow we let those slip by. I enjoy your posts and have gotten many ideas from you. Also used some of your Christmas printables this year. Thank you for your blog. I wish you and your family a blessed 2017. Wonderful thoughts, Ann! I so agree with your dreams vs. goals – when we hold so tight to dreams and not enjoy where we are is when we can’t celebrate with others when theirs do come true. Goals should be something well within our reach and control (which is why I don’t feel I can set a goal to get to 50,000 FB likes, or whatever – those channels are not under my control that I can see!) and yours are. I am lookin and excited about what 2017 will bring. Thank you Ann for your warmth and friendship from your blog. I always read your posts and enjoy them immensely! Happy 2017 to you and yours and I also am going to start walking! Stopping by to wish you a Happy New Year! Love your thoughts on dreams and goals! Wish we lived closer. I’d walk with you and Kelly and would carry a big stick to fend off the unfriendly dogs! Years ago, I had to separate my dog and another that were fighting. It was the scariest and bravest thing that I did so I understand your fear. Great suggestions in the comments, though! Thanks for your comments today. I particularly appreciate your thoughts about taking better care of yourself. I too, have the same aspiration of walking more and eating better this year. I recently discovered your blog and enjoy your entries. I found your story about your little dog to be helpful, as I have a small dog myself and I am fearful of large dogs. Your little Kelly is precious!! Dear Ann, I made six loaves of your English Muffin bread/vanilla sugar and printed tags to accompany for gifts. Got rave reviews from recipients and from my hubby! Thank you for sharing that. Wishing the best possible new year for you and yours. Love your thoughts on goals vs dreams and the fact you made reasonable goals will hopefully help you succeed. I am going to get back outside and walk this year, as well! I know my body needs it as well as my mind and spirit! Thanks for your lovely print!! Happy New Year, Ann! Thanks so much for sharing your goals and aspirations for the new year. I hope you can get back to enjoying your walks soon. For me, taking a long walk after work can be a sanity saver! I stopped making New Year’s Resolutions a long time ago because I just couldn’t seem to get past January with any of them. I like your idea of setting simple personal and professional goals. It just sounds less demanding that a resolution, I guess! What a wonderful post, Ann! You have really come such a long way since you first started blogging. I am so proud of you that you are earning money through blogging. You are very talented and how wonderful to have an outlet to sell your creations. I had never read your disclosure before so it was great to read all about how you make money. ps. I hope you can conquer the fear of walking after that attack. Happy New Year!! May you have a wonderful and blessed new year. Thank you so much for all that you share. Your artwork is beautiful. I love the calendar. Wonderful, achievable goals! That is what it is all about! I, too, have some goals, all within my reach if I choose to follow. My biggest goal is to drink more water. I need to lose a few pounds, but all these cookies and candies of the holiday must be gone. Think I’ll send them to work with hubby! I need to eat healthier, more fruits and veggies, begins today. I want to go to an exercise class at the center 2-days a week or maybe try gentle yoga to see if I like it. Quilting, yes, I want to quilt at least 3-days a week and get some ideas and UFO’s completed this year. Here’s hoping that we can keep on track, take better care of ourselves, spend time on ourselves, put ourselves first. Happy New Year 2017! Lovely first of the year post, Anne. Very honest and I applaud that. It seems you’ve suffered some sort of Post Traumatic Stress surrounding that dog attack, perfectly understandable. Must have been horrific to not be able to prevent Kelly from being hurt. I highly recommend talking to the right expert about it if you can, but anything you can do to restore your sense of power and control will help. Many folks in my area use one or two walking/hiking poles for fitness. They add stability for those who need it, without shouting “cane”, and provide a defensive weapon for out of control roaming dogs. Any physical therapist or fitness expert can advise you on their use. I use one during snowy, icy weather when walking my dog, as I have fallen one too many times. Best wishes for 2017 and for achieving your goals. It sounds like you have thought about your new year seriously. I know you have to when you have a business. I enjoy your blog and look forward to another year with you. I so wish we were neighbors. I would walk with you. Buy a can of mace and carry it in your other hand so you can spray easily. Big dogs are scary. I think it is our age about eating and sleeping. I do not get hungry anymore. Yet I have gained weight. I sleep about 3 hours a night. I did rip the carpet out. Will be chalk painting the stairs. It has taken 2 years to decide what to do with them. The wood floors I believe I am going to paint also. My wish for you is that you feel better. Happy New Year. Happy New Year, Ann! May 2017 be a great year for you, professionally as well as personally. I hope you can walk down the street with Kelly this year, that is one goal I would like to see you succeed:). Perhaps your husband or daughter can walk with you, small steps. I remember when it happened, the post you wrote. It’s hard to overcome that fear. I wish I can walk with you and Kelly. p.s. just read the comments and several readers encouraging you to walk with Kelly too! Awww, you have wonderful support here on your blog:). I don’t do resolutions. I think they leave us open for the guilt of failure. I believe in lifestyle changes. But I also believe in doing this any time of the year, not just the beginning of a new year. Also, so many people make huge goals that they cannot possibly attain. It takes baby steps, one step at a time, to reach those goals. And thank you for these calendar printouts. They are so gorgeous. I decided a couple weeks ago to schedule in on a calendar the things that I want/need to do. I’m finding that this way I am more likely to do it, and to not make excuses why I can’t. If I want to walk in the morning, if I put it on the calendar I have a visual goal. I think of it as I would a dr appt. it can’t be changed (unless an emergency arises). I started this before the new year began and I’m finding it is working well. I also schedule art making time in my studio, and it’s working. Thank you for your post. I read every single one. Oh, and Happy New Year. I want you to take care of yourself! I enjoy your blog and Kelly and want to read you for a long time. In reading today, I felt like we were talking over coffee. Be upbeat and well in 2017! These words of yours came are exactly what my goal is for the new year–every word exactly. I recently have had some issues that forced me to know I had to do this in 2017. Putting myslef first is very difficult but I do have to do it. I have other goals too but that one is the most important. I’m usually don’t comment on blogs. There have been many times I’ve wanted to on your blog that I’ve wanted to but something always stops me. So, I’m going to try and change that too. I love your blog and it really is the only one I read. I’ve deleted all others. You are so gracious and I usually love all that you offer to your readers. Recipes, printables, deorating ideas so thank you so much for sharing them with us. I look forwad to 2017 with you and your blog and wish you the very best to come in 2017. A woman with a plan….I love it. Some of our personal goals overlap. I hope we both have success. Hello Ann. What a wonderful commentary about starting the new year. I loved your honesty and candor while reading your personal and professional goals. I especially loved your thoughts on dreams. It was beautifully said and gave me pause to think about my own dreams and to put them into perspective. You are right–2017 is a new book with crisp new pages. I can’t wait to begin. Happy New Year. Happy New Year, Ann! May love and peace be your constant companions and the new year be filled with wonder and miracles. “After all this time, I don’t want to “settle.” “…..also one of my goals. And it goes back to also taking care of myself. I have always felt that I wasn’t worth nice things. ( to make a long story short ) Love this post. Happy New Year from Milan, Italy. I have enjoyed reading your blog for almost a year now. Your ideas are inspiring and helpful. I especially love your postings on the Lord it’s another reason I come back to your page. Great goals, good luck, and keep up the great work. Most mornings I scroll through my emails and the many blogs I read to find yours. Today I only read yours… because you never fail to keep it real. Thanks Ann. Good morning Ann and Happy New Year!!! I thank you for all you do and the inspiration you bring us I enjoy each and every blog post. I have similar personal goals so good luck to you and all On Sutton Home readers for a happy and healthy 2017!! Happy New Year Ann! I also just set a few goals, but personal and financial. Here’s to reaching our goals! The videos were fun to watch and much easier than scrolling casually through a lot of pictures. You know—I feel the same way about New Year resolutions!!! I always feel like a failure when I don’t follow thru. It seems that baby steps work for me and if one day doesn’t go as planned then the next day I’ll do better. Short term goals work best for me in most circumstances. I love your blog and your ideas! You’re one of the very best on here and I will continue to follow! Happy New Year, Ann and may this year be healthy and full of love and kindness!!! ???? Thank you Ann for sharing your thoughts and aspirations for the New Year. You do everything with such grace and dignity. Happy New Year and the best to you and your family!! I don’t often comment, but I love your blog…everything you do, say and make has a touch of elegance. gives me some peace of mind when walking my two small dogs. I would not hesitate to use it if need be. I don’t think I can post pic here so will send to your email address. Hope this gives you some peace of mind too! I am so pleased with your thoughts of Dreams and Goals. That is exactly what I needed to separate. Living in reality here. Thanks. First of all, Happy New Year to you. My friendship goal with you is to continue to encourage you and hopefully help you know how much you ae appreciated. You are my friend across the miles and I celebrate YOU. Happy New Year! Great thoughts on the New Year without overwhelming yourself. Good luck with the daily walks–one step at a time with fear about the dogs. I had a fear for over 16 years about dogs and I just had to give it up. A very hard thing to do, but you can do it. I enjoyed reading your goals. I used to swim every day until I had a run-in with a VERY large insect. But if you can be brave, I can try, too. My daughter used to take pepper spray with her on her dog walks which helped her get over her own fear ( her pug was attacked and died following surgery). I find making monthly rather than yearly resolutions is helpful. They have to be measurable. Instead of “meditate more”, I might say “meditate at least 8 times this month”. If I screw up I can start fresh in February. Thanks for sharing. As soon as the weather warms up, I’m going for a morning swim! Thank you. I try not to set resolutions but the dreams and goals is a nice way to look at things. Love your blog. What a lovely post. All the best to you and thanks for your blog, energy and effort. Ann, since I follow you now for some time, but never did what I wanted to do right from the start, I do it today, the first day of the month of a new year 2017 – may this one be a happier, healthier and safer one for all of us. Thank you Ann, for all your wonderful blogs, which i enjoy tremendously. I am glad to hear that you will now make a concerted effort to go out walking again with your beloved dog. I can understand your feeling, when I came to this country more then 14 years ago to marry the man I love I had a horrendous fall down a flight of 20 high!! concrete steps which left my right arm/shoulder in a permanent mess. And since then, I am always worried about another fall, but still I go out and move (slowly) :). Out of all the blogs, I enjoy yours the most. Your ideas are inspiring and not so unattainable. Wishes for continued success professionally, and achieving your personal goals. Sometimes it’s okay to be selfish – putting yourself first. Remember, you have friends and family who think you’re pretty darn important. Good morning. Always enjoy reading your blog. It gives me inspiration to try new things and learn how to decorate my home in a practical, but beautiful way. Wishing you and everyone a happy healthy 2017. I like your thinking! Your goals are reasonable, and I think I will follow your lead and set my goals today. Loved the videos. Loved the encouragement. One thing I always encourage others about. ,”Don’t forget to live and don’t think of things too seriously.,” God is in charge and he is always with us as we go on our journey. So thankful that I found this blog and enjoy it so much. One question. What kind of flooring ate you thinking about when the carpet comes up? That is the same thing I want to do this year get rid of the carpet. Just not sure what I want. I also want to change a bedroom into my home office and not sure what I want in there. I love the farmhouse look. My sweet husband loves the queen Ann look. How to mix and yet have the look I want. Any ideas would be appreciated. You have the look in your home that I have and I love love love the porch you have.